Wednesday June 2, 2010, 6:30 p.m. – 8:30 p.m. BAG members will share their books that have been on display at our exhibit at the Creative Space Gallery and then take them home after the meeting. (See *** below) If you have a book or two you’d like to share that were not in the exhibit, you’re welcome to bring them too! It will be fun to look more closely as the artist shares the successes and challenges along the route of creation! *** The Creative Space Gallery exhibit closes on May 30th and comes down May 31-June 1. Nancy and Ann will pick up the books in the afternoon and bring them to the meeting. If you want to make other arrangements for getting your books from the gallery, you may pick them up during regular hours (Thursday 4-7, Friday 2-7 or Saturday 12-6) or contact the gallery to make other arrangements. If you’d rather have the books delivered to Chittenden County and you can’t make it to the meeting, Nancy or Ann will take them home and you’ll need to arrange a time to get them. It has been such a pleasure to have all your wonderful books in the Gallery this month. The response has been overwhelmingly positive; you have opened many people’s eyes to the wonders and variety of the book arts. We are a participating location for the VT Crafts Council’s Open Studio Weekend on May 29 & 30. We will be open those days from 10am-5pm and would love to have some of our artists at the Gallery to interact with visitors. Please let us know if you are interested/available to come hang-out at the Gallery either of those days and what times you’d be available. You would be welcome to come and work on a project, do a demonstration, bring additional books to share, or just come to talk to folks. And, don’t forget to tell all your family, friends, strangers you meet on the street to come see the exhibit! B.A.G. gets coverage on Cable Channel 17!!! Nancy Stone & Elissa Campbell on Channel 17 On Wednesday May 19th, Elissa Campbell and Nancy Stone gave an enthusiastic interview on the Vermont Crafts Council, Open Studio Weekend, the Book Arts Guild of Vermont and our exhibit at Creative Space Gallery. As participants in all of those things, they even got to share some of their book arts projects! Or, you can watch it on-line by visiting Channel 17’s website. Our May meeting was full of movement challenges for all. Our own Math Whiz/Pop-up Wizardess Judy Sgantas shared some of her methods for making pop-ups move effectively and in divergent directions. She had us all using compasses and angles to figure out new tricks. As one can imagine, those math-minded people caught on right away while others arrived at the solutions with a bit of tutoring. We all left with a new understanding and appreciation for the mathematics that are involved with moveable books. At our June meeting Judy will share her latest movable book that is now on display at the Creative Space Gallery. It is delightful movable feast of mathematics. Images from the meeting are available on the B.A.G. blog. Remember also, that the Guild’s exhibit at the Creative Space Gallery in Vergennes is also part of Open Studio Weekend! You can find maps and directions to studios at the VT Crafts Council website. You can find maps and directions to studios at the VT Crafts Council website. You can also download a pdf of the 2010 Vermont Open Studio Tour Guide. Please note that this is a really big file – 10.9MB. In this creation transforming class you will learn how to use the magic tool every artist should have, the amazing Dremel tool. You will drill, cut, carve, etch, shape, polish, and grind non-traditional book making materials such as, glass, plastic, metals, wood, clay and more. You will be able to make books out of just about anything! After this class your material options will be limitless. You will try your hand at working with various materials and using several bits for different purposes and effects. As you play with materials you will be making pages for your sample book for later reference. No experience necessary. Class & materials fees: $200 all-inclusive. The fee includes a set of bits for the Dremel tool and materials for the class. Spots in the workshop will be filled in the order in which the applications are received. You will receive confirmation of your registration via Email. After registration, you will be sent a list of tools to bring to the workshop. Note: The workshop has only been announced to the Book Arts Guild and those on the Studio Place Arts mailing list. On June 1st, we will begin publicizing the workshop outside of the Guild. If you are interested in taking the workshop, please get your registration in soon – the class is already 1/2 full and we expect that the other spots will fill up quickly. For additional information, please contact Elissa Campbell at erscampbell[at]gmail[dot]com or (802) 229-1342. Peter Thomas, author of More Making Books by Hand: Exploring Miniature Books, Alternative Structures, and Found Objects, will be teaching a one day workshop will explore the exciting world of the artists’ Peter Thomas, book artistbooks. Participants will be given instruction in basic bookarts techniques as required and will make two miniature books. One will be a three inch accordion book with a unique structure developed by Peter and Donna Thomas. This “nested pop up accordion fold” has a second accordion that weaves in and out of the first. The second book another unique and innovative binding created by Peter and Donna Thomas, which they call the scrolling case bound book. They recently used this structure for their acclaimed edition of The Mystical Quality of Handiwork. Advanced students may have time to put text in their books and will want to come prepared with a short 4-10 word quote to work with. If time remains, Instructors will show a collection of about 50 miniature books made over the last 3 centuries, and talk a bit about the history of the artists’ book. All materials will be provided, but students may want to bring their own papers to substitute. This will be fun and informative workshop and students will go home with two completed books. Note: As we were just presented with this opportunity, we are still working out the details. The only thing we know for sure is that it will happen in August. Once we have the specifics, we will let you know. *** Boutilier’s Art Center on Church Street is moving to a new location and is giving away a selection of store fixtures for free. Apparently they’ve tried Craigslist and had no success in finding homes for these fabulous pieces. If you’re looking for a paper storage solution, these would be perfect (teachers?). Did I mention that they’re free? The green wire rack has 20 slots for holding sheets of paper up to 22″ x 30″. There is only one of these. There are 2 sets of wood racks – each has 4 racks attached by hinges. They can be taken apart and used individually. Alternatively, you could keep the racks attached and set them up on the floor, similar to a folding screen. One set has 11 rungs and the other set has 9 rungs. The rungs are approximately 26″ wide and would be great for hanging sheets of paper. Join me, Jane Davies, for a four-day adventure in collage and mixed media at my studio in beautiful rural Rupert, Vermont. Housing and Meals: You will be accommodated in a beautifully renovated guest house, which is conveniently located next door to my studio. It has full kitchen facilities and two full baths, a wrap around porch, a barbeque, and water frontage (a stream runs along the back side of my studio and the guest house). *** July at the Garage Annex School is packed chock full of wonderful workshops. And to facilitate your experience we are offering a lodging and meals option a couple blocks away at the Williston-Northampton prep school. It’s going to be great fun. Our July concentration of workshops starts off with a bang: The Leather Intensive with Daniel Kelm. During this six-day rich, learning experience each participant will make a full-leather binding using techniques traditional to English and French construction. Close on Daniel’s heels, we welcome Julie Chen back when she offers—for the first time anywhere—a five-day workshop: The Secrets of the Magic Tablet. Part book, part optical paper toy, the tablet structure presents the opportunity to create mesmerizing illusions. This workshop will be an enjoyable blend of creative expression and the learning and execution of a precise structure. Next comes a weekend of Leather Onlay & Inlay with Daniel Kelm. These traditional techniques for design remain very popular since lettering can be created as well as abstract and figurative images. Martin Antonetti and Smith College are offering you another opportunity to spend two days in the rare book room studying The History of the Book for Book Artists. Last but not least—and for the first time anywhere—Pam Spitzmueller will offer Coptic Cover Decoration. You can expect to learn techniques such as stitched leather tracery backed with contrasting colored leather or gilded parchment; cold tooling with small tools building up larger designs or friezes; lacing of parchment ribbons in straight and curved borders; multi-line panels or borders; and built-up line patterns that form intricate stars or interlaced crosses. We’ve clustered these workshops together in case you out-of-towners want to take more than one. We are very pleased to welcome Shawn Sheehy to GAS for the first time. He will help you bring exciting dimension to the page when he teaches Animated Pop-Up Structures. In this three-day class, you will learn the fundamentals for building both pop-up and movable structures. 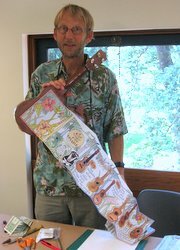 Eric Alstrom will wind up our July concentration of workshops when he returns to teach Board Reattachment Using Japanese Papers. Both tightback and hollowback volumes can be treated using just pennies’ worth of paper in a fraction of the time it would take to lift the old leather, pare the new, and reattach the covers. These repairs are perfect for smaller volumes, but can be adapted for larger books, too. Check out the Garage Annex School website for other classes, just over the MA border. *** The 23 Sandy Gallery in Portland, OR has a call for entries for Pop-Up Now! A National Juried Exhibition of Movable Books. The exhibition is presented in conjunction with The Movable Book Society’s 2010 conference. The deadline for entries is 7/10/10 and the exhibition dates are 9/2/10 – 9/25/10. Jill Timm, teacher of our upcoming The Amazing Dremel workshop, is one of the jurors for the exhibition. For more information, visit the gallery website. ***Note: Please submit news for the “MailB.A.G.” at least one month ahead.